Nearly as impressive are the 15 times he has finished runner-up, which Spieth sees more as opportunity than any measure of failure. 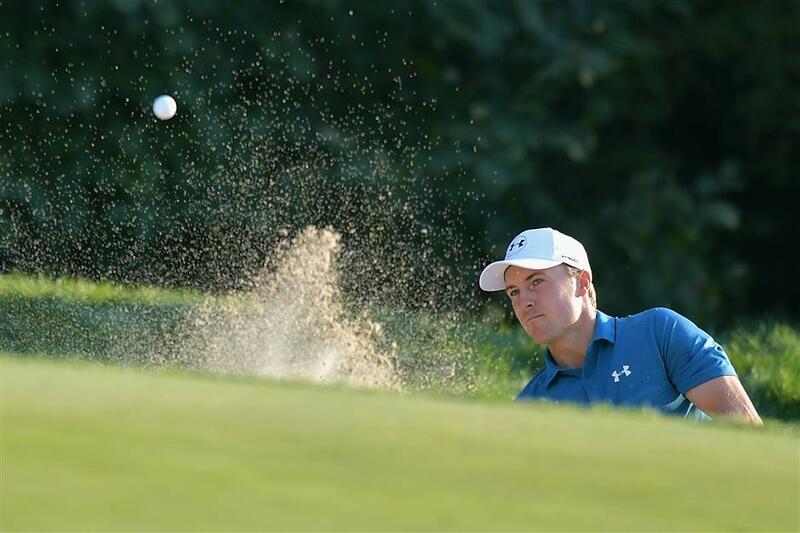 Jordan Spieth of the United States plays a shot from a bunker on the 18th hole during the final round of the Dell Technologies Championship at TPC Boston in Norton, Massachusetts, on September 4, 2017. Jordan Spieth already has won 14 times around the world, which already places him in unique territory. Over the last 75 years, Jack Nicklaus and Tiger Woods are the only other players to have at least 10 victories and three majors before turning 25. That's only part of the Spieth profile. "I know you're indifferent when you're asking the question, but I think of it positively," he said on Wednesday. "There's been that many tournaments that I've been in the thick of things and truly had a chance to win." That includes the last two FedEx Cup playoff events. Spieth lost in a playoff on Long Island when Dustin Johnson smashed a 343-yard drive and a hit a wedge to 4 feet for birdie. Then, he was tied for the lead at the TPC Boston with five holes to play until Spieth missed two greens with long irons and Justin Thomas didn't miss hardly anything in a three-shot victory. There are worse times of the year to settle for second. Those consecutive runner-up finishes elevated Spieth to No. 1 in the FedEx Cup going into the BMW Championship, and that's not a bad place to be. He is assured of being among the top-five seeds who only have to win the Tour Championship next week to capture the US$10-million bonus. "If I finish runner-up this week, unless one of two other people win, I will have accomplished the goal of being No. 1 going into East Lake," he said. Johnson and Thomas are the players to whom he referred, and that's only part of the battle at Conway Farms in Lake Forest, Illinois. The primary goal of the 70-man field is to finish in the top 30 and get to East Lake for the Tour Championship, where everyone has a mathematical shot at capturing the FedEx Cup and its lucrative prize. The top five seeds have the best odds, though Bill Haas at No. 25 won it in 2011. Haas is on the bubble this year at No. 30, a few spots behind Jason Day, who said on Wednesday he will use friends to caddie the rest of the year instead of Colin Swatton, his longtime coach and the only caddie he has ever had on tour. Right behind Haas are a pair of rookies, Mackenzie Hughes and Xander Schauffele, both PGA Tour winners this year, both wanting a lot more. Spieth can't recall a time in his career — pro or amateur — when he was runner-up at three straight tournaments. He was runner-up in consecutive weeks in Texas in 2014, losing in a playoff in Houston and by four shots at the Texas Open, and then following that up with a wire-to-wire victory at the Masters. Then again, he's not the only player in good form. Johnson is finally back to full health from his back injury on the eve of the Masters, having rallied to beat Spieth at The Northern Trust and starting the final round of the Dell Technologies Championship three shots behind until he never recovered from a slow start. Thomas has won twice in his last three starts, the other at the PGA Championship for his first major. Thomas already has five victories this year and would be a shoo-in for PGA Tour player of the year provided Spieth doesn't win the last two tournaments to claim the FedEx Cup. They have been close friends since they were 14. Thomas said he was motivated by Spieth more when Thomas was in college and couldn't compete against him. That's not the case as much now. "I want to win because I like to," he said. Spieth looks at opportunity to win. Equally amazing to his 15 runner-up finishes in just five years as a pro is that in nine of them he either lost in a playoff or finished one shot behind. It speaks to a bigger picture of identifying the staying power of the best in golf. Rory McIlroy, for example, has 21 victories and 20 runner-up finishes in his career. Johnson has 16 victories and 10 runner-up finishes. "I don't know what Tiger's amount was, but I imagine first versus second was significant," Spieth said with a smile. For his career, Woods has 91 victories and 37 runner-up finishes. In the majors, Woods has 14 victories and six second-place finishes. Spieth has played 128 events as a pro. Woods through 128 starts had 28 victories and 11 seconds. And then there's Nicklaus. Along with setting the benchmark of 18 majors, he had 19 runner-up finishes in the Grand Slam events.